New Tide Pool Stinky Ginger – Coming Soon! Good morning, delightfully scented people! We’re happy to let you know that if you were looking for something blue and stinky to raid your pantry(or toy shelf, if you must), you will definitely have a chance next week! We love this new edition of Stinky Ginger called “Tide Pool Stinky Ginger” by Chris Ryniak, and we think you will too. She doesn’t like anyone, but that isn’t your fault – it’s a hard life as a condiment. 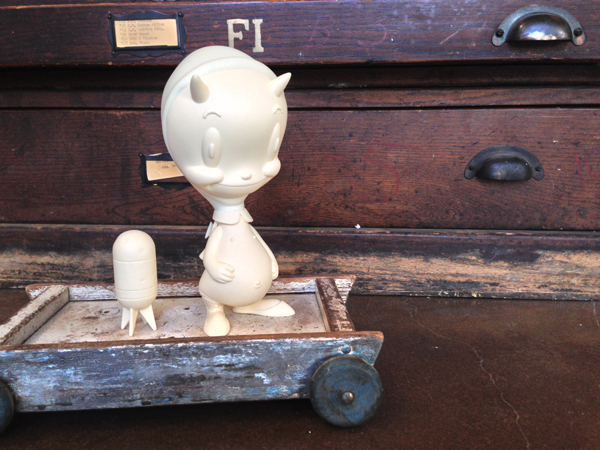 This one is a small edition size of 60, with Stranger Factory receiving 30 for North American customers(International sales, please visit our partners, Tomenosuke.) – so clear out some space in your kitchen, and exercise that F5 finger. We’ll have more details on Monday, so stay tuned! Oh hey, we have more progress images from Colin Christian! 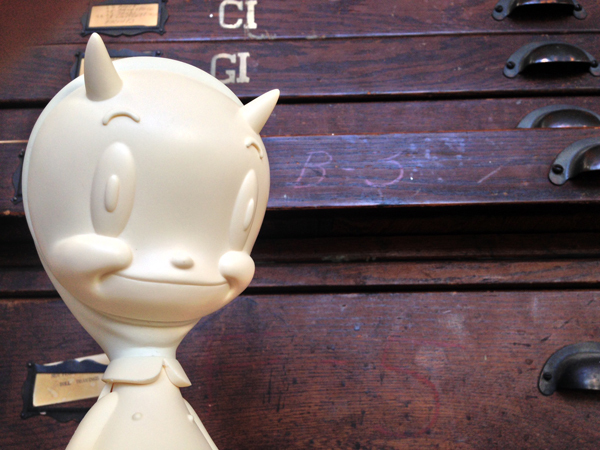 He’s been busy preparing for the opening at Stranger Factory next week, and some of these new sculpts above are brand spanking new to us. If you haven’t noticed, Colin has an affinity for sci-fi and hyper sexualized beautiful vixens, and these ladies are classic Colin Christian. 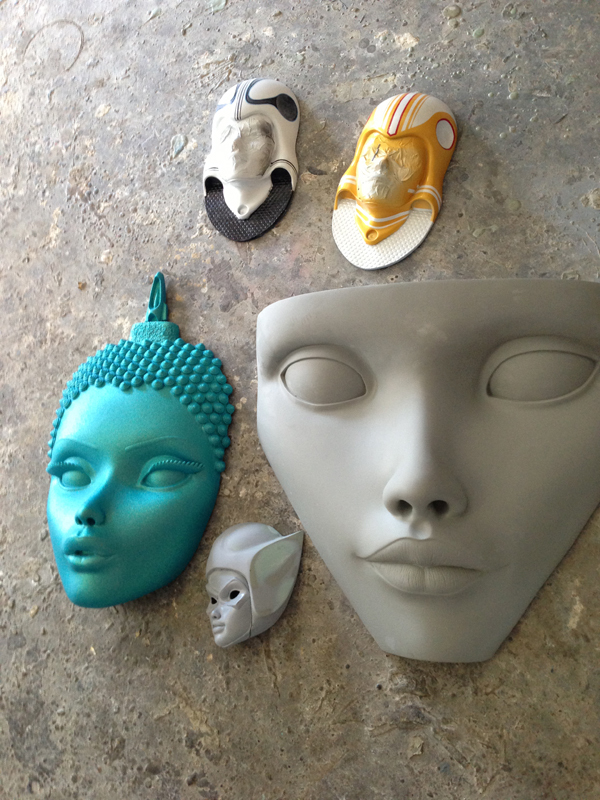 The size of the face on the right has us very intrigued….are we talking womp rat or Serenity sized here? Last week, we had a post on a tentacle creation from Colin, and this week, she might have a partner in intergalactic exploits. 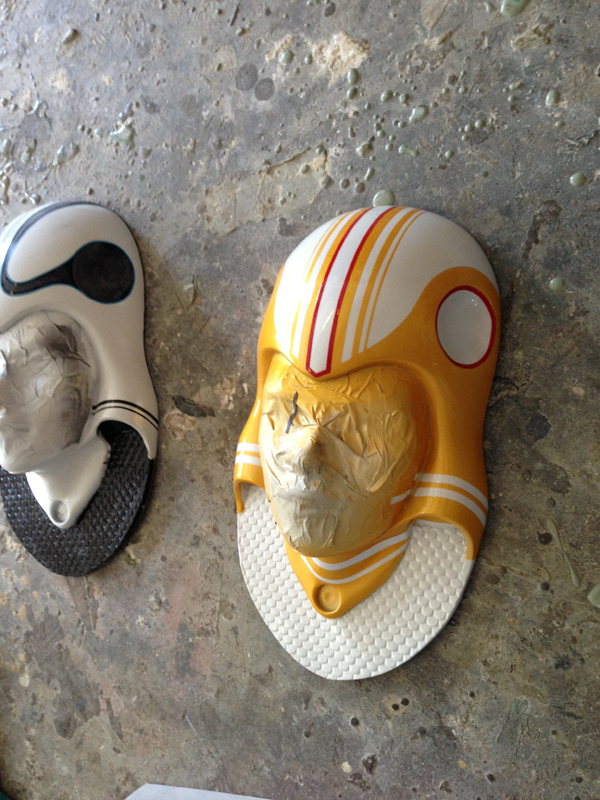 This yellow version has almost the same structure but maintains slight differences in paint and helmet style. It looks like more tentacles will be added shortly, and we still haven’t seen the beauty under the mask yet. We cannot wait to see the rest of Colin’s show, and we’ll be keeping you updated! Colin’s exhibit along with Phil Noto and Glenn Barr runs July 5th – July 28th, with an opening reception on Friday, July 5th from 6 – 9 PM at Stranger Factory. Phil Noto has the rare ability to capture a spark in painting with a delicate grace, and this one is no exception. This might be the last image you see of a beautiful soul that will never grace your path again except in your thoughts and hopes(or fortunately, within the walls of Stranger Factory in July). 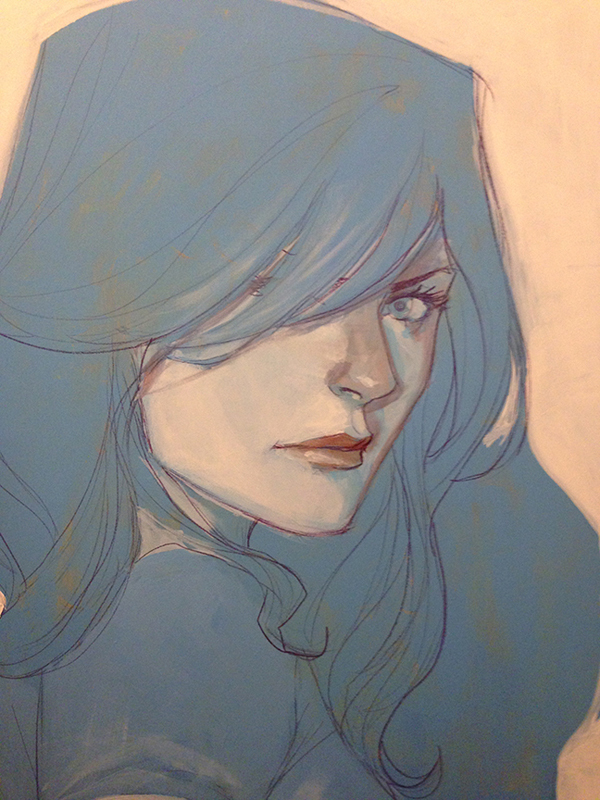 Not only is Phil Noto known for his astounding comic art, but he is a master at capturing the stunning female form. We can tell by this work in progress painting that this is once again, indeed a perfect display of Phil’s talent. The piece is already captivating, and we can only imagine how the finished version will be. Phil Noto’s solo show runs July 5th – August 4th, with an opening reception on Friday, July 5th from 6 – 9 PM at Stranger Factory. Phil will be present, and is also teaching a painting workshop on Sunday, July 7th. Holy corncob, Batman! It looks like Kathie and Brandt are getting ready for SDCC at superspeed! There will most definitely be custom mini greeters for the convention – some in super hero attire, or an arch-villain, and even a bee! This is probably just the tip of the Mr. Freeze iceberg…. We will know more soon but remember the San Diego Comic Con is July 17-22! Stop by the Cardboard Spaceship booth(#5346) on Saturday to say hi to Brandt Peters, Chris Ryniak and Amanda Louise Spayd, and check out the work from the Circus Posterus crew! Is it getting cold in here? Continuing with our titillating teasers for this upcoming piece, we bring you the full monty! Now, we do not know when this guy will drop…because as you can see, this is a pure prototype, but we wanted to share his cute little cheeks with you for now. 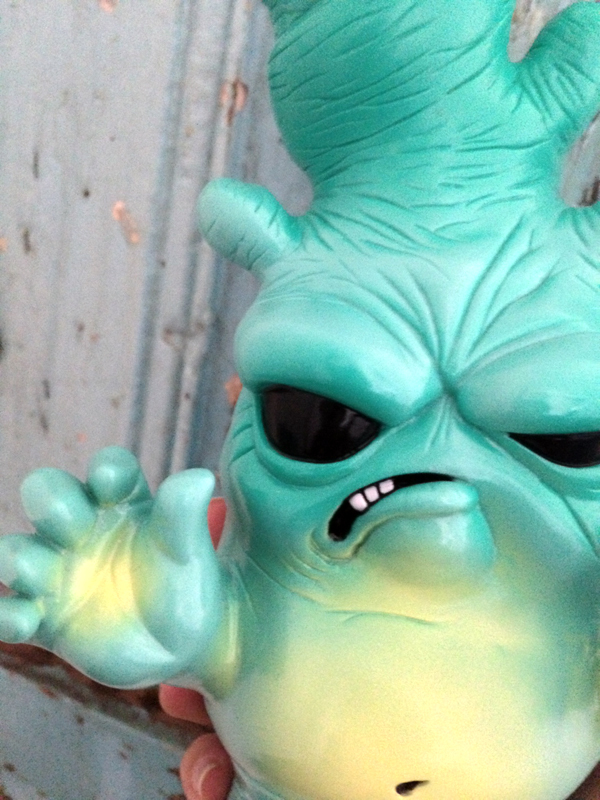 Last week, we told you about the Brandt Peters X Ferg – TERROR BOYS OOZE [OILISH], and we left the post with “10% of the run will feature a random alternate ooze helmet color”. Well, look what we have here!!!!!! 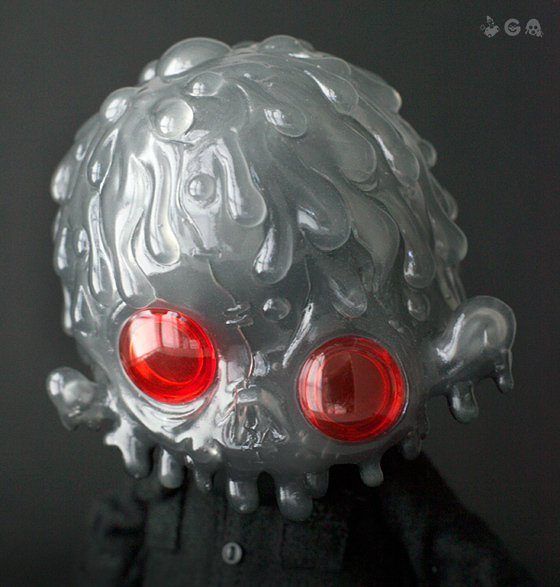 The chase OOZE petroleum helmet is a translucent light grey with black spray inside. Look for this release really soon…and good luck finding this one! 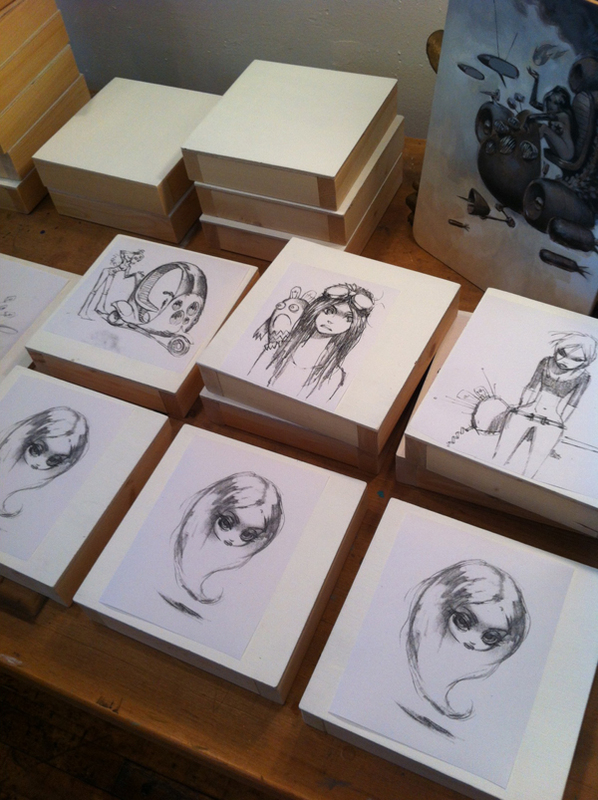 With our continued coverage of the July show at Stranger Factory, we now have an image of Glenn Barr‘s work table! The above image reads like a storyboard. Of course, every one of the images has one of Barr’s beautiful female figures. It looks like we’ll be seeing some of his classic sci-fi elements, at least in the top three sketches, and we’re pretty excited about it! We will see how the finished products turn out shortly, but for now, these should whet your appetite. Glenn Barr’s exhibit along with Phil Noto and Colin Christian runs July 5th – July 28th, with an opening reception on Friday, July 5th from 6 – 9 PM at Stranger Factory. The thing about writing about artists that exhibit at Stranger Factory is that I am genuinely a big fan of most of them. Brandt and Kathie are amazing curators, and no crap makes it through the doors of their gallery. So, yeah, I’m a fan, and it’s really wonderful being able to write about artists you love. 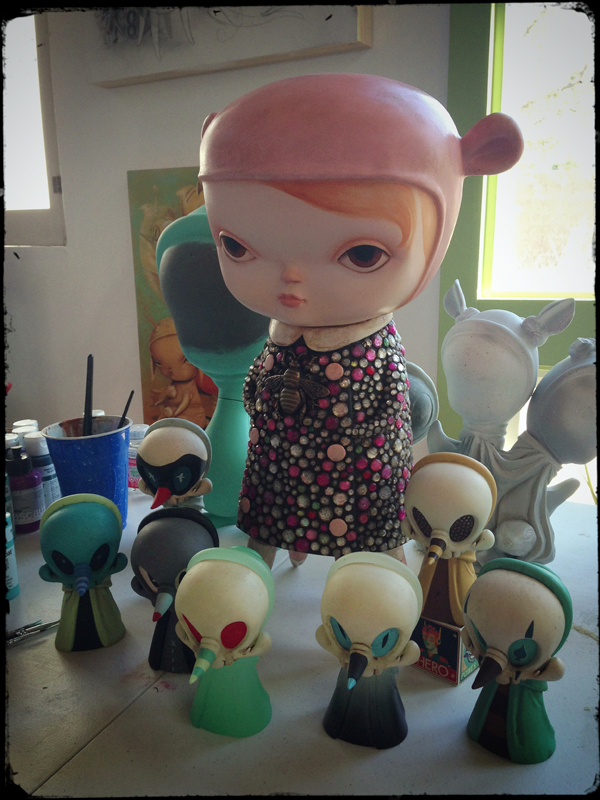 But sometimes, an artist is scheduled to show at Stranger Factory, and I’m kind of not just a fan, I am a total fangirl. And then, I have to get my act together because no one wants a wide eyed blubbering fool writing about their show. 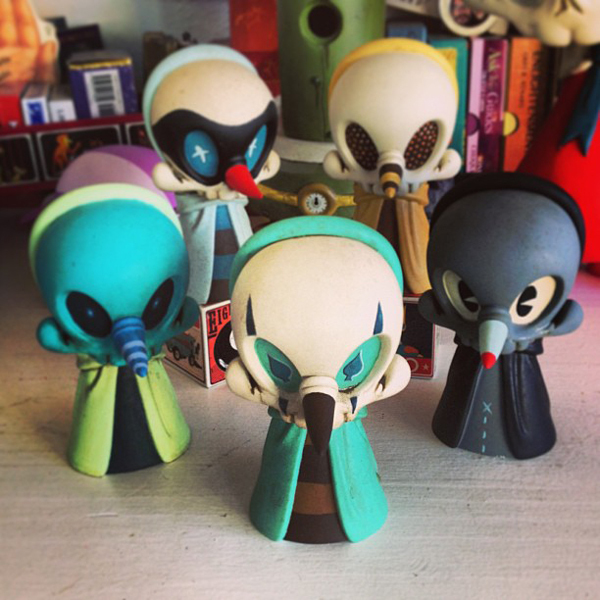 Fortunately, Phil’s work has been a frequent guest at Stranger Factory, so at least I’m reasonably calm about it now. So, today, I’m just gonna show you a few of Phil Noto’s gorgeous comic book covers, all rendered in his trademark retro-inspired style and his unfailing eye for colour. I’m not going to dwell too much on how his cover for Batgirl #2 stopped me in my tracks in a comic book store a couple years ago(and there’s a nice retrospective of his Batgirl covers here), or about how his Birds of Prey covers have been the most consistently stunning, or about how glad I am that in a comic book world still filled with impractical women in uncomfortable poses, Phil Noto’s ladies are consistently strong, coy, elegant and playful – all at the same time. So, right. I’m a fan, and here are some of my favourite Noto covers. 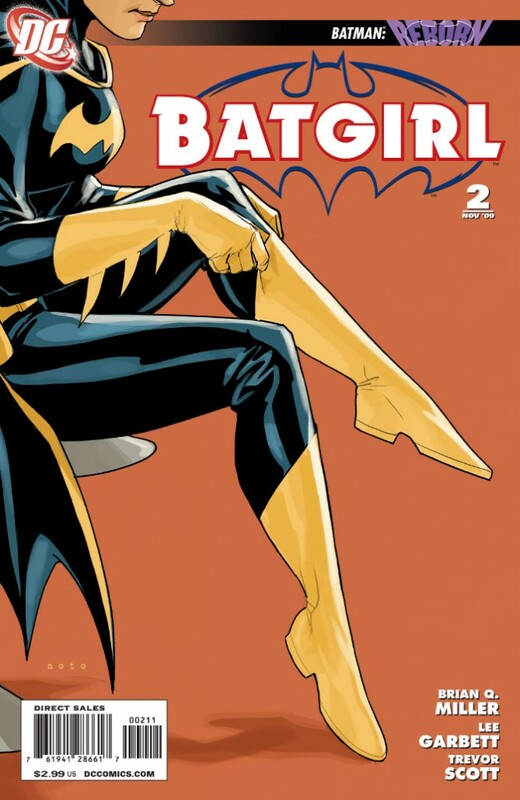 The aforementioned Batgirl #2(It’s a good run, and has my second favourite Batgirl). Click “more” to read on. For this round of Circus Folk, we take you to a Circus fan far far away, to the island of OZ aka Australia, with Brent Maloney. We know that our loyal Circus Folk know no geographical boundary, and Brent is one of the many who reside almost a full day’s travel from our home base. This means that dealing with time zones and shipping can be troublesome, but from what we have seen, Brent hasn’t had too many issues! 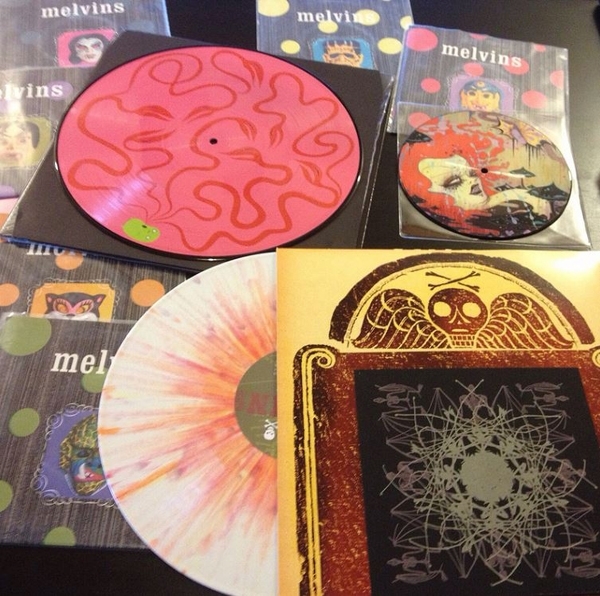 Sit back and look at some of Brent’s collection, and take notice, because he is also a VERY avid record collector, especially of The Melvins. 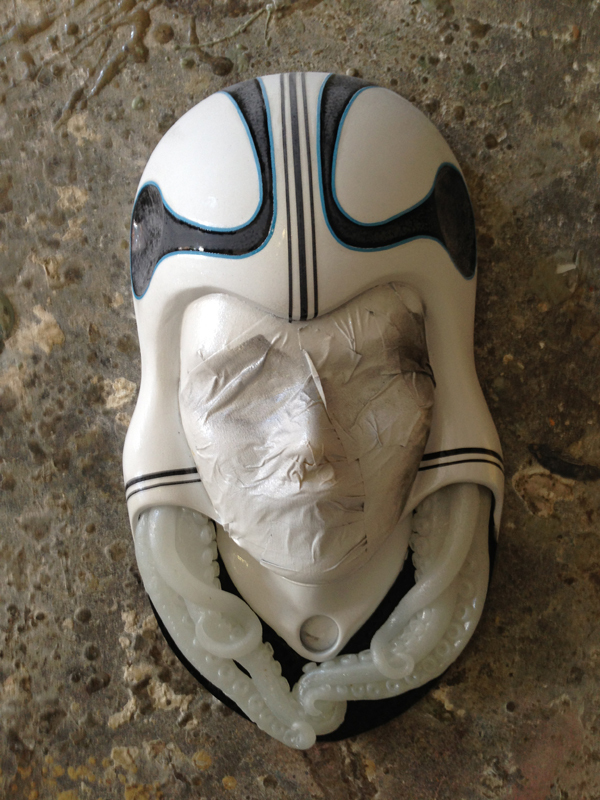 With the July opening right around the corner, progress images are pouring in from Colin Christian, Phil Noto, and Glenn Barr for their shows at Stranger Factory! With the above work in progress picture, I would say Colin Christian is channeling the original Battlestar Galactica, Beyond the Valley of the Dolls, and Cthulhu all at the same time because this piece is stellar! The Sci-Fi feel of this sculpt is going to appeal to many of us, from the classic space travel styled helmet to the tentacles flowing below the chin like locks of medusa hair. We can also surmise that under that tissue paper, is a majestic and beautiful female face, as per Colin’s tradition. Once this piece is done, we’ll be trying to show off the finished version because this is looking fantastic even in the early stage!